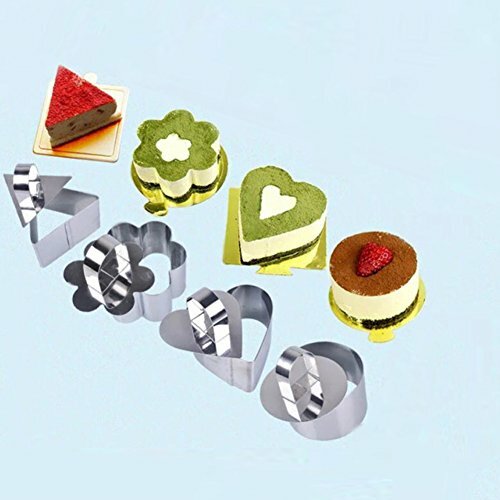 Stainless Steel 8 Pcs Set Dessert Rings:4 Covers & 4 Rings (1 Round,1 Heart,1 Plum,1 Triangle) Mousse and Pastry Mini Baking Mold with Pusher by Jasni Liu at My Beautiful Cake. Hurry! Limited time offer. Offer valid only while supplies last. 8 Pcs Set includes 4 Ring Covers & 4 of 4cm (1.6") height Dessert Rings: 1 Pcs of Round,1 Pcs of Plum 9cm (3.5") Diameter; 1 Pcs of Heart,1 Pcs of Triangle L*W: 7.7*7 cm（3"*2.8 "）. Excellent design for cooking various-shaped eggs or pancakes for your lover as well as your family. With this egg mold, you don't bother how to make a good shaped for your food,Lovely and cute shapes make your kids good appetite. 18/10 Stainless steel; Easy for cleaning, oven and dishwasher safe. If you have any questions about this product by Jasni Liu, contact us by completing and submitting the form below. If you are looking for a specif part number, please include it with your message.